This release has been released to accompany the pressed volumes of The Work Vol 1 to 5, and are not to be confused with the Thunderball originals - hence TB R.I.P. Okay - to the music! It's a bit hit-or-miss for my tastes and there's no strong theme running through each disc and appears to be a smattering of outtakes/alternate versions lumped together with little thought - that said, it has it's moments. 'Turn It Up' is superior quality to the 'The Work Volume 1' version. 'Around The World In A Day' has some noise interference halfway through the track, although that could possibly be a bad disc I have (anyone else?). 'Girls & Boys' is identical to the released version, however it has a spoken intro by Wendy, and an abrupt ending. The highlight of this volume (for me) is Prince's solo 'Witness 4 The Prosecution' (#1). It was recorded by Prince in March / April 1986, before he handed it over to Wendy & Lisa to add their vocals, etc, and is FAR superior in my opinion. 'Housequake' (Razormaid) was shelved by Prince as a possible official remix - why, I dunno, as it wipes the floor with the Mo' Quake versions that appeared on the 12". I could spend all day reviewing each and every track here, but I won't. A nice collection of tracks, but certainly not an essential in anyone's collection. 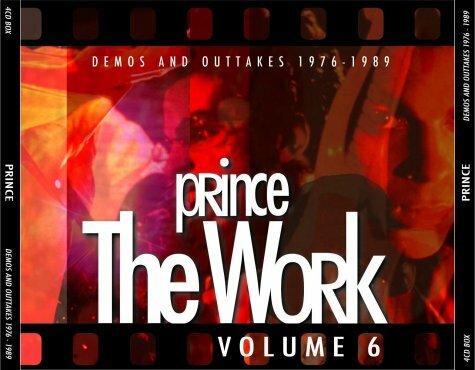 The "The Work" title is simply too confusing an association to the Thunderball releases to make any sense and the only thing they appear to have in common is they both contain unreleased studio material. Yes it's good, yes it's listenable, yes there are some gems on here, but nothing particularly earth-shattering and I'd choose any original volume of "The Work Volume 1-5" over this any day..